Many would not put Islam and mindfulness together; some would say that one is not synonymous with the other. Some Muslims suggest that mindfulness or meditation is un-Islamic or haram (forbidden) because it has originated from Buddhism, and still may carry some of its tenets. In this blog, I challenge that idea, and propose that mindfulness is central in the very foundation of Islam, and can support an Islamic way of life. By focusing on the present moment in a deliberate and mindful way, we can learn to become more aware of arising thoughts, feelings and sensations in the body. Being aware of our present experience in a non-judgmental and compassionate way, helps us to acknowledge and accept these thoughts, feelings and sensations in the body, so that we can take a step back and assess our response before responding reactively. Therefore, the practice of mindfulness connects us to the present moment, and teaches the mind a new way of relating to thoughts and feelings, so that we can choose how to respond to circumstances that arise within our everyday life rather than react impulsively. The concept of mindfulness is not new. There have been many accounts of the prophet Muhammad himself meditating and reflecting for much of his time. Many of the practices within Islam focus on doing things mindfully. For example, one of the pillars of Islam is to pray (salat) five times a day – this is a form of mindful movement, a meditation of gratitude and humility in front of Allah (God). Below, I have reviewed six cornerstone principles of Islam which are also the fundamental precepts of mindfulness. One of the core beliefs in mindfulness, and Islam, is of the fitrah – there is no exact English equivalent of this word but it refers to the basic premise that there is a pure core within everyone. At the heart of mindfulness lies an inner quietness, a moral compass, a wisdom which we all possess but can sometimes lose sight of when living in this busy world. While practicing mindfulness, we can access this inner purity of the fitrah, so that we can connect to ourselves and to Allah (God), which is of benefit to us both on an individual and universal level. The calm and unconditional acceptance of what is—that is, there here-and-now—manifesting itself in a calmness that refuses to succumb to worry and anxiety. Such serenity can only arise when there is a calm acceptance of reality or life—on life’s own terms. The regular practice of mindfulness creates a unique opportunity to cultivate these qualities—simply by a calm awareness of whatever is, an acceptance, trust and surrender to life itself. This does not mean that we resign to the injustices of life, or unacceptable behaviour of others – it means that we make wiser choices about how we respond to the challenges presented to us throughout our lives. The process of spiritual jihad consists of the internal struggle we experience between our impulses or inner desires, and our values, or the way in which we want to behave. This process is the becoming aware of how we behave and respond just like in the process of mindfulness. Jihad is striving to enforce the central values in Islam such as compassion, respect, courage, honesty and self-discipline which is also in line with mindfulness teachings. While we learn how to respond, rather than impulsively react within mindfulness, we are learning sabr. How many times in our lives have we felt angry, and lashed out with hurtful or angry words without thinking? Or have impulsively decided something, which we may have regretted later? Through the strengthening of sabr through mindfulness practice, we learn to create a gap between thinking, feeling and acting, which gives us the skills to be fully conscious of the choices we make. In turn, this teaches us to be more disciplined and manage our lives and emotions more wisely. From an Islamic point of view, was-was are the whisperings of the shaytan (Satan). In the world of psychotherapy and mindfulness, these whisperings are seen more as a part of one-self which criticises us, judges us, perhaps ridicules us. Whichever perspective we adhere to, most people would agree, that these whisperings, or the negative internal dialogue which we all carry, can sometimes be destructive and unhelpful. The practice of mindfulness, helps us to observe these thoughts without engaging with them, so that they do not impact our lives in a negative way. We learn to become aware of these whisperings, and allow them to come and pass by. And by learning how to disengage from this internal dialogue, we are more able to pay attention to what we choose to focus on, rather than get lost in the spiral of negative thoughts or behaviours. One of the skills we learn when we practice mindfulness, is the skill to judge ourselves less and be more loving towards ourselves and others. In the Quran, mercy and compassion is mentioned many times – we are encouraged to be compassionate towards ourselves and to others. From a neuroscience perspective, if we are more kind to ourselves, then we are more likely to be kind to others. In addition to this, being kinder to ourselves, helps boost the immune system, and is better for our psychological and physiological wellbeing. At the core of Islam resides peace and love. 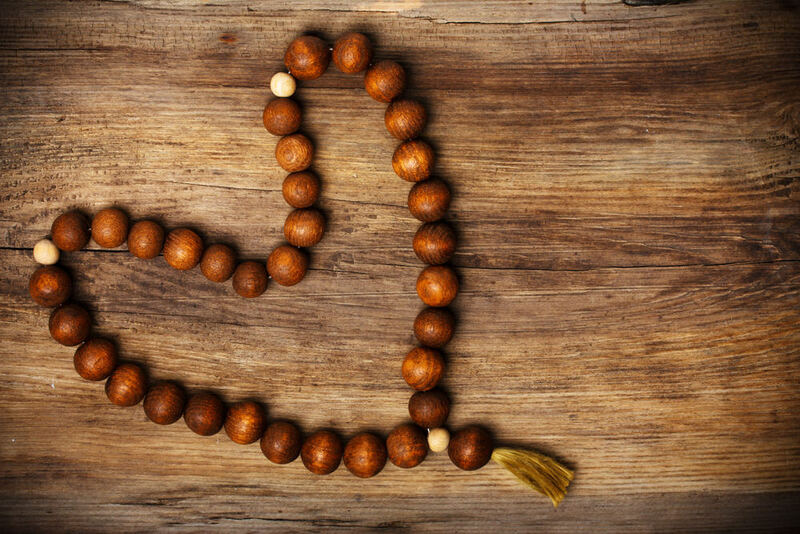 Practising mindfulness within Islam can harness, develop and connect to this peace and love, in a more meaningful and fulfilling way. Whether mindfulness is practiced formally in a class, or through an activity such as walking, praying, eating, or standing in a queue, it is possible to connect with and experience the beauty that lies within us and beyond. Through regular mindfulness practice, we can tune into the peace, calmness, tranquillity, wisdom, love and compassion which lies in the present moment. If you would like to read more about mindfulness and how it could benefit you, you can read my blog Anyone for Mindfulness? You can also try a mindfulness exercise by going to my website or by clicking here to download the counting meditation. Previous Post What’s the relationship between sleep and depression? This is a very interesting post and beautifully written. It makes me think both how wonderful and alike the basic teachings of religions are. Mindfulness is obviously an ancient practice too, even if it has had other names and has been linked with various philosophies which have helped us to be content and kind. Hi Amanda. Thanks very much for your comment. I’m glad that you liked my blog 🙂 Have you tried the counting meditation, which is free for you to download and use from my website? You can also receive a free gift of a loving-kindness meditation if you sign up to my newsletter. Would be great to have your feedback on it. And remember you can share my free mindfulness downloads with your friends and family too!